This article is about an urban area in Hong Kong. For other uses, see Kowloon (disambiguation). "Kowloon" is a transliteration of 九龍. For other transliterations, see 九龍 (disambiguation). Kowloon (/ˌkaʊˈluːn/; Chinese: 九龍; Cantonese Yale: Gáulùhng) is an urban area in Hong Kong comprising the Kowloon Peninsula and New Kowloon. It is bordered by the Lei Yue Mun strait to the east, Mei Foo Sun Chuen and Stonecutter's Island to the west, a mountain range, including Tate's Cairn and Lion Rock to the north, and Victoria Harbour to the south. With a population of 2,019,533 (2 million) and a population density of 43,033/km2 in 2006, it is the most populous urban area in Hong Kong. The peninsula's area is approximately 47 km2 (18 sq mi). The name Kowloon stems from the term nine dragons, alluding to eight mountains and a Chinese emperor: Kowloon Peak, Tung Shan, Tate's Cairn, Temple Hill, Unicorn Ridge, Lion Rock, Beacon Hill, Crow's Nest and Emperor Bing of Song. 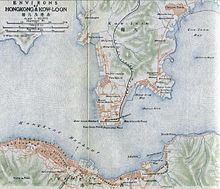 The part of Kowloon south of Boundary Street, together with Stonecutters Island, was ceded by Qing China to the United Kingdom under the Convention of Peking of 1860. For many years the area remained largely undeveloped, used by the British mainly for tiger-hunting expeditions. The part of Kowloon north of Boundary Street (New Kowloon) was leased by the British as part of the New Territories under the 1898 Second Convention of Peking for 99 years. Within New Kowloon is Kowloon City, an area of Hong Kong where the Kowloon Walled City used to be located. The Kowloon Walled City itself was demolished in 1993. The same area was called Guanfuchang (官富場) during the Song dynasty (960–1279). "New Kowloon" has remained part of the New Territories. Statutorily, "Kowloon" is only the area south of Boundary Street and Stonecutters Island, but in common use, New Kowloon is not regarded as part of the New Territories but as an integral part of the Kowloon urban area whether north or south of Boundary Street. Large-scale development of Kowloon began in the early-20th century, with the construction of the Kowloon-Canton Railway and the Kowloon Wharf, but because of Kowloon's close proximity to Kai Tak Airport, building construction was limited by flight paths. As a result, compared to Hong Kong Island, Kowloon has a much lower skyline. After World War II, Kowloon became extremely congested when slums for refugees from the newly established China gave way to public housing estates, mixed with private residential, commercial and industrial areas. The area of reclaimed land known as West Kowloon was once home to a dockyard for the Royal Navy. One of the many tunnels that link Kowloon with Hong Kong island. A 13-foot high stone wall was built in 1847 around Kowloon. The 1911 census recorded a population of 7,306, with most being Hakka. The invasion of China by Japan in 1937 caused the population of Kowloon to explode. Between 1937 and 1939, 750,000 refugees arrived in Kowloon and nearby areas, with many being homeless. As of 2011[update], 2,108,419 people lived in Kowloon. 94.2% of Kowloon's residents are of Cantonese ethnicity. The largest ethnic minority groups are Indonesians (1.8%), Filipinos (1.5%), Indians (0.5%), Nepalese (0.4%), and Whites (0.3%). 86% of Kowloon's residents use Cantonese as their usual language, while 2.3% use English and 1.2% use Mandarin. Kowloon East includes Wong Tai Sin and Kwun Tong. Kowloon West includes Yau Tsim Mong, Sham Shui Po and Kowloon City. An Air France Boeing 747 passing above Kowloon, prior to landing at the old airport more than 20 years ago. Star Ferry Pier, with the Hong Kong Cultural Centre and Tsim Sha Tsui Clock Tower in the background. ^ 10,000 Chinese Numbers. Lulu.com. p. 207. ISBN 9780557006212. Archived from the original on 23 August 2016. ^ "Hong Kong 2003 – History". www.yearbook.gov.hk. Archived from the original on 26 September 2011. Retrieved 28 April 2018. Wikivoyage has a travel guide for Kowloon.